The importance of CIC and their relationship to a variety of diseases has been the subject of study for many years. Formation of immune complexes is protective and usually benign process of a normally functioning immune system. CIC are removed from circulation by a number of complex biochemical, enzymatic and cellular processes. Key to all of these, however, is the complement system. In certain disease states, immune complexes may initiate complement mediated damage of various organs and tissues. This activation of complement may begin a series of potentially destructive events including cell lysis, the production of anaphylatoxins, leukocyte stimulation and activation of macrophages. Major tissue damage can also occur when CIC fix to cell membranes as in some cases of glomerulonephritis. More than 40 assays have been developed to measure CIC's, many of these require multiple complex steps and sophisticated equipment. Since the characteristics of CIC vary widely, none of these assays has been accepted as a standard. In fact in a comprehensive study, the WHO determined that no single method was appropriate to measure CIC in all disease states and that a combination of two different methods and techniques be used. 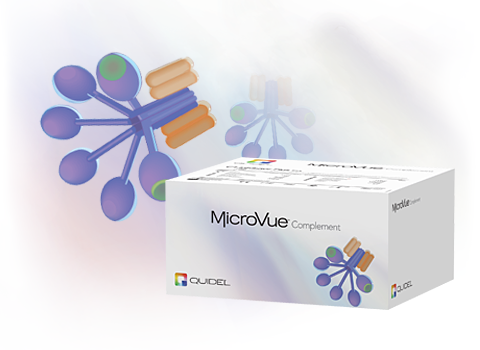 The assay uses highly pure, functional human C1q coated in the solid phase to capture immune complexes (CIC). In the first stage, CIC in the diluted patient samples and HAGG in the controls and standards are dispensed into the C1q coated assay wells. After incubation, unbound material is removed in a washing step and a ready to use conjugate (goat anti-human Ig-HRP) is added. After a second incubation, unbound conjugate is washed away. After addition of a substrate and a short incubation interval, the quantity of CIC in the sample (µg Eq/ml) can be determined by comparison to a standard curve.